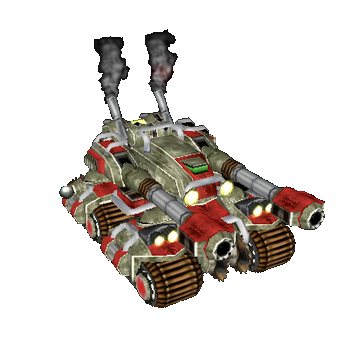 A resilient endgame tank that provides high burst damage with its ultimate. The ultimate can also increase respawn times which gives the player more opportunities to siege the opponent’s base with less defense. Enables you to drive over trees, cliffs and units. Also accelerates your tank by 25% and damages units with 300 dps near you. 1 7 30 sec. - 250 Lasts 3 seconds. 2 14 30 sec. - 250 Lasts 6 seconds. 3 21 30 sec. - 250 Lasts 9 seconds. 4 28 30 sec. - 250 Lasts 12 seconds. 5 35 30 sec. - 250 Lasts 15 seconds. Take Aim increases damage against a specific target. Each time you aim for the same target, the bonus damage will increase further, up to 4 times. Lasts 16 seconds and refreshes with each stack. Creates shields in front of your tank, that reduce damage coming from the direction they are facing by 60%. Lasts 7 seconds. 1 10 40 sec. - - Shields span over 30°. 2 20 40 sec. - - Shields span over 60°. 3 30 40 sec. - - Shields span over 90°. 4 40 40 sec. - - Shields span over 120°. 5 50 40 sec. - - Shields span over 150°. Fires two heavy projectiles in a straight line over a range of 2000. If enemy tanks die, within 10 seconds after being hit, their respawn time increases. Has a 1 second casting duration. Fires non-homing shots at random targets in 900 range. Deals splash damage. If ‘Take Aim’ is active, the Heavy Tank Cannon fires at this target, with 1300 range. 1 - 3 sec. 900 200 Deals 200 Damage to each unit at targeted area. 2 - 3 sec. 900 200 Deals 400 Damage to each unit at targeted area. 3 - 3 sec. 900 200 Deals 600 Damage to each unit at targeted area. 4 - 3 sec. 900 200 Deals 800 Damage to each unit at targeted area. 5 - 3 sec. 900 200 Deals 1000 Damage to each unit at targeted area.